What is track changes, and why would I want to use it? Working with more than one author or reviewer: Who did what? This chapter in Word format. This Chapter was originally written for Word 97-2000. It is valid for all versions of Word after that but the menus and toolbars mentioned were replaced by the Review tab in Word 2007 and following. Using Track Changes in Word allows you to do electronically what you used to do manually. No more red marks on a printed document; no more circled text with arrows indicating moves. Track Changes is composed of two parts. The first is viewing edits in a document as you make changes and the second is comparing two documents, frequently called "redlining." Double-clicking the TRK (Single-clicking on Track Changes in Ribbon versions) button on the status bar at the bottom of the Word window turns Track changes on or off. They have been turned on in the first status bar below. The status bars above all have the Track Changes status displayed. In Ribbon versions, you can turn this display on or off by right-clicking on the Status Bar and picking what you want to see. It is recommended that you always have the display of the Tracked Changes status turned on in any setting where confidential information may be in a document. In versions 97-2003 selecting Tools > Track Changes > Highlight Changes will access Track Changes. (Review Tab in ribbon versions) You may also access this by turning on the Reviewing toolbar or (double-)clicking on TRK in the status bar at the bottom of the window. In versions prior to Word 2007, the reviewing toolbar pops up automatically when you turn Track Changes on, but can be closed by the user. To set the options you want for revisions, select Tools > Options > Track Changes tab (Word 97-2003) or right-click on the TRK status in the status bar and pick Options. In later versions, use the Review tab to get to options. Inserted Text The default is an underline. You may change this to Bold, Italics or double underline. A specific color may be chosen. The default, "By Author" marks the first eight reviewer's comments with different colors. Selecting "Auto" or a specific color, marks all inserted text in that color. Deleted Text The deleted text default is Strikethrough. You may select Hidden. Then deleted text can be shown or hidden with the Show/Hide button on the Standard toolbar. If you do not want the deleted text to appear on the screen, you may select the ^ or # symbol. Changed Formatting The default is none. If you want to show the differences in formatting, select bold, italic, underline, or double-underline formatting. This will not pick up the difference in font color if it is changed. Changed Lines The default is outside border. Every paragraph that has a change shows a revision mark next to that paragraph. These marks can be shown on the left, right, or outside borders. As a lawyer, I generally recommend that people leave at least "Make hidden markup visible" or "Warn before printing..." checked. Hidden markup is one very big source of what is called metadata that may reveal confidential or internal work that you do not want disclosed. You want to know about this. 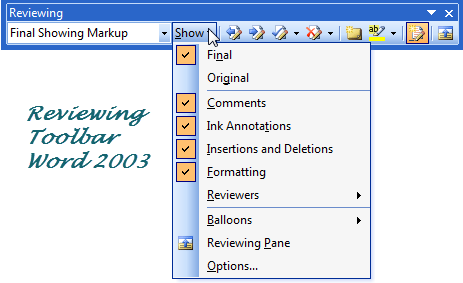 In Word 2002+, changes are often shown in balloons. This changes your displayed and printed formatting dramatically (when changes are shown). You can turn this off in the track changes options. Turning this off for tracked changes also turns it off for comments. In Ribbon versions of Word, you can access the options dialog under the Track Changes button on the Review tab. Open a document for editing. Double click TRK in the Status bar (Click on Track Changes in the Status Bar). Select the Options of your choice in the Options dialog and click OK.
Change the formatting of a word or paragraph. Pause the cursor over the changes in the document to see when and by whom they were made. When you receive a document with changes, you have several options for viewing the changes and accepting or rejecting them. In Word 97-2003, to access these options, turn on the Reviewing toolbar by alternate-clicking any toolbar and selecting Reviewing or select Track Changes under the Tools menu or (double-)click on TRK in the Status Bar. Above, dropdown of Track Changes options in reviewing toolbar. Below, variations in appearance of toolbar. Pause the cursor over any marked change and a ScreenTip appears. Tip If you do not see the tip, make sure that they are activated by clicking Tools > Options > View tab > Screen Tips. In versions of Word after Word 2000, the changes may appear in balloons rather than screen tips. 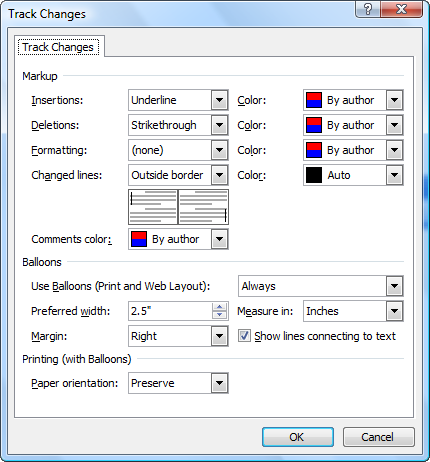 (Word 97-2003) clicking Tools > Track changes > Accept or Reject Changes > Original. (Word 2007-2013) choosing to view original in the Tracking portion of the Review tab. In Word 2007 and later, Track Changes is controlled on the Review Tab. To review the changes in a document, click Next Change or Previous Change on the Reviewing toolbar. As each change is selected, click Accept or Reject. (Word 97-2003) select Tools > Track Changes > Accept or Reject Changes. Select the appropriate choice. You will receive a message asking whether you want to accept/reject all remaining changes without reviewing them. If you select No, you will continue reviewing the changes one at a time. (Word 2007-2013) use the Accept or Reject buttons on the Review tab. Choose the appropriate choice from the drop-down menu. If you do not want your changes marked, turn Track Changes off by double-clicking the TRK (Single-clicking the Track Changes) on the Status bar. If you cannot turn it off, the document has been protected with a password. To assure that all reviewers have their changes tracked, protect and add a password to the document. Open a document you want to protect. Select Tools > Protect Document. Select Tracked Changes, type a password that you are sure to remember in the Password box, and click OK. Confirm the password by typing it in the Confirm Password dialog box. Use the Restrict Editing button on the Review tab or Developer tab. Select Tracked Changes as the type of Editing Restriction. Click on the button to Start Enforcement. Type a password and confirm it. IMPORTANT NOTE: Microsoft recommends that most law firms use a third party solution for document comparison, such as Lexis-Nexis' CompareRite, or Workshare's Deltaview. See the chapter on third party solutions for more information about these products. Microsoft Word's compare documents features works on relatively simple documents that do not contain too much complex formatting. Because of the complex nature of most legal documents, Word's compare documents feature does not produce as good a result as the third party products mentioned above. Microsoft is currently working to address this shortcoming, but in the meantime the third party solutions are recommended. CK NOTE: In Word 2000, there is a bug that shows up when the document includes one or more tables. A workaround is given for this situation in knowledge base article Q246486. The workaround is to use the reviewing toolbar rather than the dialog box to Accept or Reject Changes. If you use the dialog box and a row has changes in more than one cell, only the first change in the row will be handled, any others will be skipped. CK NOTE: Recommended method of comparing complex documents within Word. Convert one or both to text files and use Word to compare the text files. You won't get formatting changes but will pick up all changes to your text. The compare document feature allows Word to compare one document to another and mark the differences between the two. These marked changes appear on the screen in the current document. If you wish to save the changes in this marked document, select File > Save As. If you do not need to save this "compared" document, it can be printed and closed without saving changes. Open a new, blank document and type This is an original patent application. Save the document as Original Pat.doc. With the document still open, change the word, "original" to "amended." Add the words Filed on (today's date). Select File > Save As and name the document Amended Pat.doc. Leaving this file open, select Tools > Track changes > Compare Documents. This dialog box will open and you may select the original document by double-clicking. The changes appear in the document. Click File > Save As, and name the new document Compared Pat.doc. The first thing to remember is that this is not a mail merge! Document Merge is a powerful feature in Word that allows you to take a document that has been reviewed by a number of people and quickly incorporate or merge these edits into the original document. Each editor's revision is marked in a different color. If there are more than eight people involved, the colors will be repeated. After you merge the changes into the original, you can then accept or reject each change. Protect the document by clicking Tools > Protect Document. Choose Tracked Changes and add a password. Remember that the password is case sensitive! After the document has been protected, tell others it is ready for review. The document can be sent to all reviewers via e-mail or on a floppy disk. After it has been reviewed and edited, the changes can be merged into the original document. Select Tools > Merge Documents. 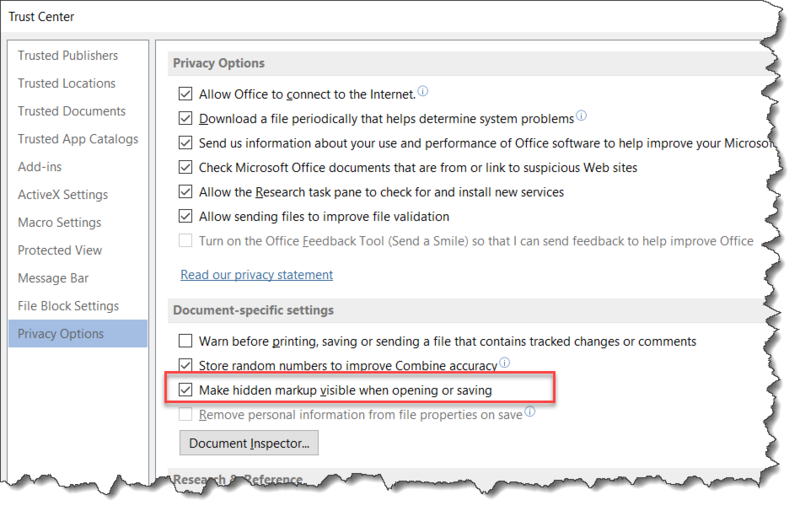 Double-click one of the documents containing changes or click Open. Repeat step seven until all changes have been merged. You now have a single document (your original) with all the merged changes. Select Tools > Track Changes > Accept or Reject Changes. Click the Find arrows to navigate through the document and choose to Accept, Reject, Accept All, or Reject All to incorporate these changes into your document. If you've used CompareRite for generating your compared documents in the past, you can continue to use it in Word 97 and Word 2000. It is available from LEXIS-NEXIS. Another product that is making a big splash in the legal market is DeltaView made by Workshare Technologies. At the time of this writing there is a downloadable trial version of DeltaView at http://www.workshare.net/. CompareRite information is available from LEXIS-NEXIS at http://www.lexisnexis.com/. As mentioned above, Microsoft recommends that for now, when comparing complex documents, these third party products should be used instead of Microsoft Word's built-in compare documents. You can insert Comments into a document and either print or conceal them. In Word 97-2000 inserting a comment appears to highlight the preceding text (but the highlighting does not print) and moving the mouse cursor over the highlighted area displays the comment on screen as a tool tip. 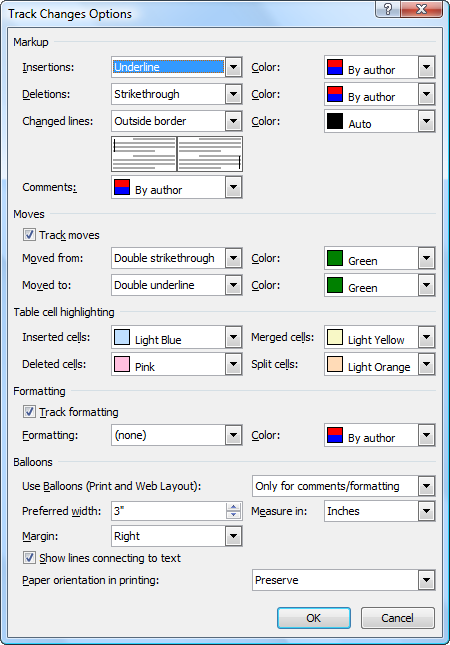 In Word 2002- comments are displayed in an expanded margin in balloons, by default. This not only displays, but prints. You can change this back to the Word 97 method under the Track Changes options. Tell Word that you want balloons displayed Never. When you hover over a comment in text or in a balloon, you will see the name of the person who commented and the date and time for that. This information does not print out. Here are screenshots for balloon and inline display of comments. Comment displayed in balloon. Mouse-over the balloon gives more information. Comment displayed inline. Mouse-over comment marking gives more information. Why is Track Changes on when I just opened a document to edit? It had been turned on when the document was last closed. To turn it off, double-click TRK on the Status bar. If this does not turn it off, there is probably a password attached and it is protected. Four people have edited the document. How can I tell who did which edits? Pause the cursor over the edit and it will show you the author, date, and time of the edit. Each new editor (up to 8 people) gets a new color, so once you find out which person goes with which edit color, you can quickly tell who edited what. I need to send this document to a client. How do I get rid of all the editing marks? You can accept all changes, reject all changes, or go through them one by one and mark to accept or reject them individually. Can I use Word's Track Changes and then use CompareRite or DeltaView? This is not a good idea as the document may become corrupt no matter which one is used first. Track Changes does not notice changes in Case when done through the Shift+F3 shortcut. Nope. This is true in Word 95-Word 2019. Document Compare will catch the change, though. I want Track Changes to be on in every document I open or create. How can I do this? I do not recommend this. However, it can be done using macros in the Normal template. See this forum thread for the set of macros that will do this.